Pre-heat oven to 350 degrees F and line a cookie sheet with foil. 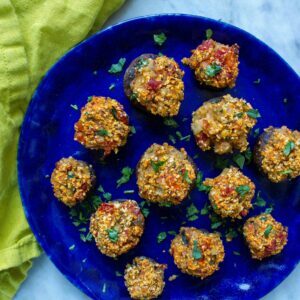 Toss the mushrooms in 1 tablespoon extra virgin olive oil and place bottoms up on the cookie sheet. Take mushrooms stems and dice. Heat a large sauté pan over medium heat. Add another 1 tablespoon of olive oil and add diced onions and mushroom stems with ½ teaspoon salt and ¼ teaspoon pepper and sauté until soft, about 5 minutes. Then add garlic and sundried tomatoes and sauté for 1 more minute. Add chicken broth and simmer until the liquid is reduced and completely absorbed. Stir in parsley leaves and thyme. Transfer mixture to a food processor and add matzo meal and 1 more tablespoon extra virgin olive oil. Pulse until you have a slightly mushy mixture. Add salt to taste. Stuff the mixture into the mushrooms- don’t be afraid if they are over-stuffed. Use all the filling! Bake in the pre-heated oven for 20-25 minutes or until mushrooms are cooked and filling is hot. Cool for 5 minutes and serve! Make ahead: You can make the filling 3 days ahead up until the part where you add the matzo meal. Right before serving, pulse filling together, stuff and bake.